I swore to work on a commission for someone, I apologize. I was compelled to draw one of my favorite characters (villain, I should say) from one of my favorite Disney films. I believe I drew Ratigan MUCH better than I did five years ago. One thing that slightly bothers me is the crown. I probably drew it a little too tall. 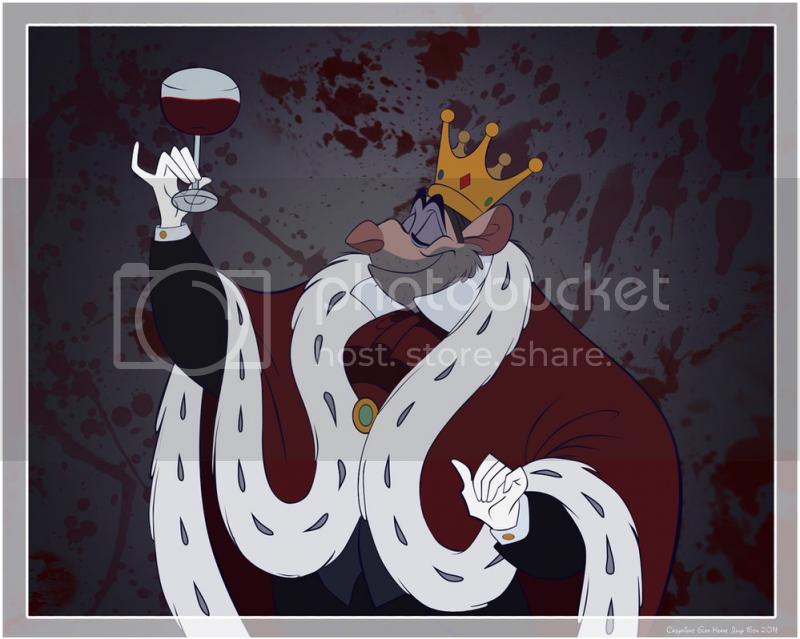 I wanted to make this picture dark, though; blood of Ratigan's victims all over the walls. Taking a sip of red wine...Or is it blood? I've always wanted to draw dark art. It's creepy, but beautiful at the same time. I think Vincent Price was one of the MOST genuine horror actors of all time. One of my favorite actors. He was a real gentleman, very refined and cultured. Very few people nowadays do NOT know who he was, and that makes me sad. Not literally, but you get my point. Professor Ratigan rightfully belongs to Disney animator Glen Keane.